We are in Hanoi. We would have liked to have spent more time in Luang Prabang but our options to get back into Vietnam turned out to be very limited. The bus service, that I had planned on from Vientiane to Vinh, in the NorthCentral part of Vietnam, turned out to be fully booked with the large Vietnamese community living in Laos returning to their ancestral homes for the Lunar New Year celebrations. And at the very best if we would manage to find a place we’d be transported in a mad house of Vietnamese stuffing their boxes and bags in every conceivable cavity. So we had a choice of flying to Hanoi or Ho Chi Minh City and we grabbed the last two seats on today’s flight to Hanoi at $ 150 each. Then another surprise awaited us at the check in counter. My multiple entry visa for Vietnam expired yesterday. I had paid for a 90 day Visa but never bothered to check the fine print. Iris also paid for a multiple entry Visa but to her chagrin discovered that they had issued her a 30 day single entry Visa. So we both ended up having to buy another Visa, with express service Sunday surcharge, of $ 90 each….. We rented bikes again to see a few more parts of Luang Prabang till we had to head out to the airport at 2.30 p.m. First we toured the temple grounds of the Xieng Thong temple grounds. This was built in 1560 as an ordination hall for the coronations of the kings of Laos when Luang Prabangwas the capital before it was changed to Vientiane. Much of the interior and exterior are elaborately decorated with gold leaf . Next visit was across the river to a village where silk weavers, carvers, etc. sell their handicrafts directly from their work shops. On the way to the village we asked our way to a young couple wo turned out to be from near Grouw in Friesland; Iwan and Miriam de Jong operate a marina http://www.sneekerhof.nl/ and adjacent vacation bungalows on Sneeker lake. I had been looking for just such a set up for when my children are to come and visit this summer. So, they might have run into a potential customer in Luang Prabang. 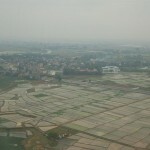 After we got the visas sorted out we were off to Hanoi. 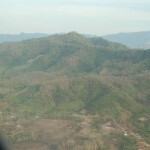 I was amazed at the extensive Teak plantations near L.P. in the hills we flew over. From the air, just as they appeared along the highway to L.P., the trees looked kind of sick and dying but I just read on the internet that Teak drops it foliage in January/February. The bulk of these plantations were started in the eighties and they all appear to be of a similar size. We found a good hotel in the old quarter of Hanoi, where I had stayed in 2006. Iris, being in the travel/hospitality business herself got us set up for three day is Halong Bay and two days in Sapa and then we bought an open bus ticket from Hanoi to Saigon, where we can make 4 stops of our choice and timing, which we plan to use to see Hue, Hoi An, Nhatrang and probably Dalat. We will try to sell our flight tickets from Hanoi to Saigon on the 11th now that we ended up travelling south from Hanoi instead of up from Central Vietnam. Teak Plantations, the spindily grey brown trees. My patience paid off, I had to search for a vantage point making an educated guess where the moon might rise over the surrounding hills. 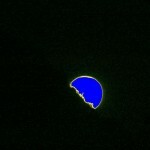 So here you have it the moon set on Friday and the full Blue Moon rise this evening. I am waiting for Iris to come back from her 7 p.m. Buddhist service. There is no Catholic mass here. I rode shotgun in the mini bus from Vangvienand got lots of good roadside shots of the magnificent scenery. The road wound through valleys and up and down mountain ridges. This is mostly Mong tribesmen country. Women carrying heavy loads in the hard whicker back baskets. 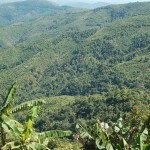 Lots of Teak plantations and the clear cut pock marked mountain sides. Luang Prabang is even more romantic and idylic than the expectations I had from the travel guides; wedged as a peninsula where the Mekong forks into another branch. We rented bikes and it is a delight to see all the old colonial style buildings and Buddhist temples and monasteries. Lots of very inviting eating places along the high river bank. A lot more class and style than Vangvieng, it reminds me of places like Carmel, California or de Cote d’Azur. The hotels are dearer, we are paying $15 here. 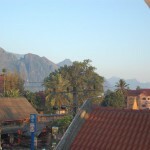 It is early Friday Morning in Vangvieng, about 150 k.m. 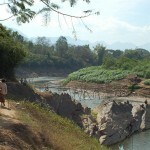 North of Vientiane. 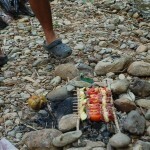 I hope to have some good pictures in the next posting of the canoeing, hiking trip scheduled for today. Vangvieng is at about 1000 feet above sea level in a valley not far from where the CIA operated a secret air base during the Vietnam conflict and training the Mongh tribesmen to fight the Pathet Lao. Not sure where I left off since I have to pretype this without an internet connection. 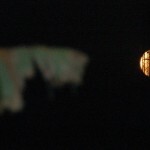 We arrived around 9 p.m., Wednesday night, at our hotel in Vientiane, the Laotion capital. It was a nicer hotel, owned by a US Taiwanese, $36 per room. We are paying here $ 7.50…., no a/c, which you hardly need here in the cooler mountain air, no t.v. which neither of us ever uses. 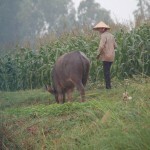 Many of the back packers frown at rates above $10 anywhere but the major cities in Indochina. Dormitories for $ 1 to $2 a night. 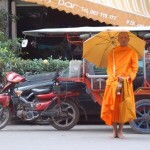 Vientiane is a much calmer city. 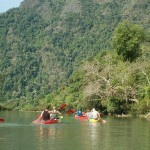 And we are told that Luang Prabang, next stop will be even more laid back. 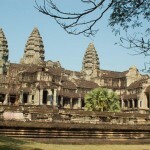 So in order of the busy and fast past of Saigon, it would be Hanoi, Phnom Penh, Siem Reap, Vientiane and L.B. There are several very interesting Buddhist temples in Vientiane but the one most remarkable is Pha That Luang a giant Gold Leave painted stupa. 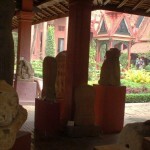 Stupas are where usually relics are kept of Buddha. This one is supposed to have part of his breast bone. 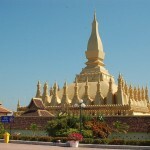 It is also considered to be the national shrine for Laotion Buddhism and Lao sovereignty. In 1641 Gerrit van Wuysthof of the Dutch East India Company visited Vientiane and reported the “enormous pyramid, the top of which was covered with gold leaf weighing about a thousand pounds”. 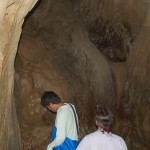 We took the bus from Vientiane and arrived after dark in Vangvieng. It turns out that we may have some difficulties taking the planned bus connection from Vientiane to Vinh, Vietnam because they are overbooked with the large Vietnamese population living here returning to their ancestors homes for Tet. Our short flight from Siem Reap to Vientiane left in the early evening, which gave us time to to tour a silk farm and visit the Siem Reap Cultural Center. The silk farm was started with French financial support as an effort to give employment to the local rural population who otherwise end up drifting to the cities. It now employs over a thousand men and women. They have a well organized apprentice ship program to teach raising of the silk worms, growing the mulberry shrubs, spinning and the traditional silk weaving. Unfortunately, I accidentally removed all the pictures from the memory chip, of this visit and the ones at lunch time of the butterflies at the Butterfly Cafe. The Cultural Center was a sort of theme park, very well done, showing the life styles of the main ethnic groups in Cambodia. 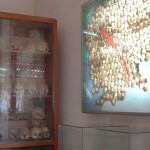 The Khmers, Chams, Chinese etc. There was a Khmer wedding reenactment for which a woman and man were pulled out of the audience to participate in. Iris was one of them. We are staying in an older colonial era hotel on the Mekong here in Vientiane. It is now Wednesday morning and time for breakfast and planning the things we want to see here before heading further North to Luang Prabang. 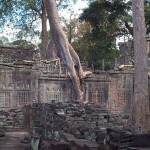 Today we toured the ruins of the actual Angkor Wat, the largest of the many different temples. 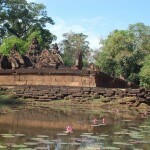 The next most well known is Angkor Tom, which was our second stop; followed by another 4 ruins. It is still difficult to describe the emotions that I felt walking through these grounds where once a civilization reigned, between the 7th and 14th century. which built the largest structures in the world. Tomorrow we fly from here to Vientiane, Laos. We plan to stay there a couple days and then bus to Luang Prabang about which we hear all very high praises from fellow travellers. This is one of the first Sundays that there are no pictures of the inside of a church, just temples. 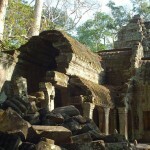 We visited 6 different temple ruins. I’ll spare you the names. 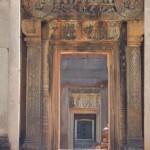 Tomorrow we will visit the actual Angkor Wat ruins, together with another 4 or sights. It is hard to even try to explain the immense size of this whole complex. Only recently have archeologist discovered from satellite imagery that the area stretches out much further than we had before taken for granted. The pictures also showed the details of the aqua ducts that irrigated Ankor and it’s surroundings, from the Mekong and the nearby lakes. An area much greater than, as an example, the city of London, where at the time these immense structures were started the city of London counted around 60,000 inhabitants. Fortunately we did not run into the same hordes like the ones we witnessed last night viewing just another sunset. We are sharing a tuc-tuc ( a four person two wheeled trailer hitched to a light motor cycle) with Sigrid and Juergen Pastor, a German couple we met on the boat and who also happen to be staying in our hotel. They are cycling through Thailand, Vietnam, Laos and Cambodia for 4 weeks. They are from Saxonia, between Leipzig and Dresden. They are in their late fifties and have cycled all over Europe and also once participated in an organized cycle tour through Oregon. I hope to see them again in Germany. Friday 22 and Saturday 23rd. 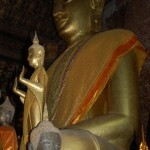 At Ankor Wat. Saturday morning: The city is waking up. 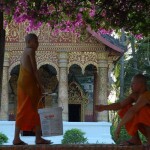 It is 6.45 a.m. Four Saffron robed monks are striding past me. People are doing their early morning calisthenics on the river front. Our 3 hour river boat trip to Siem Reap takes off at 7.30. Friday we visited the “Russian” market, the main market for souvenirs and handicrafts, silk, etc. Next we visited the temples in the Royal palace compound. I had done this on my earlier visit, two weeks ago, but this time we used a guide and that made the visit much more interesting. 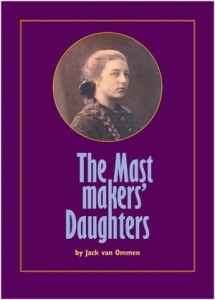 Particularly being explained the relationship of the religion and the royal family. 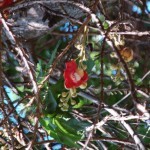 The picture below shows the flower and the fruit of the Buddha Tree. The flower of this tree only blooms for one day and then it drops it’s bright purple petals, which are gathered and used everywhere as offerings in the temples and the small home altars together with the incense sticks. The botanical name of the Buddha Tree is Shorea Robusta Roxb. This makes it a relative of the very common commercial woods like Meranti and Serayah; this to remind you that I am on a retired bus man/lumberman’s holiday. We stopped at one other pagoda complex, this is the headquarters of Cambodian Buddhism, founded in 1443. I need to do a lot more study on the many variations of the Asian religions, so many mixtures of Hinduism and Buddhism, Taoism, etc., are manifested in the symbolisms in the art work of the temples and in the way of worship and daily life. We ran into Phil and Leilani Roberts after dinner. akes off at 7.30. Friday we visited the “Russian” market, the main market for souvenirs and handicrafts, silk, etc. Next we visited the temples in the Royal palace compound. I had done this on my earlier visit, two weeks ago, but this time we used a guide and that made the visit much more interesting. Particularly being explained the relationship of the religion and the royal family. 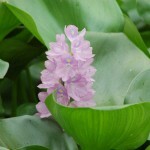 The picture below shows the flower and the fruit of the Buddha Tree. The flower of this tree only blooms for one day and then it drops it’s bright purple petals, which are gathered and used everywhere as offerings in the temples and the small home altars together with the incense sticks. The botanical name of the Buddha Tree is Shorea Robusta Roxb. This makes it a relative of the very common commercial woods like Meranti and Serayah; this to remind you that I am on a retired busman/lumberman’s holiday. We stopped at one other pagoda complex, this is the headquarters of Cambodian Buddhism, founded in 1443. I need to do a lot more study on the many variations of the Asian religions, so many mixtures of Hinduism and Buddhism, Taoism, etc., are manifested in the symbolisms in the art work of the temples and in the way of worship and daily life. We ran into Phil and Leilani Robson after dinner. Saturday: we have arrived in Siem Reap. 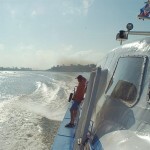 It was a fast ride in a jet boat. 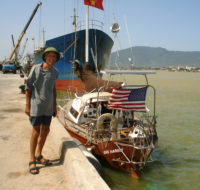 The scenery was similar to the ride from the Vietnam border to P.P. but the weather was better. 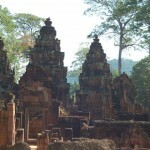 We will spend two days visiting the whole of the Ankor Wat ruins compound. 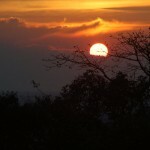 This evening we went to see the sunset from one of the highest point on one of the ruins. I was disappointed. I had expected that the silhouette of the ruins would be in the picture but it were the flat Mekong delta lands and the enormous lake. There were droves of tourists all following the highly touted claims. Yesterday I could not manage to get on line. I left off yesterday’s blog that we spent Tuesday evening with a couple from Vancouver, B.C., Phil and Leilani Robson. We met them on Monday on the tour. 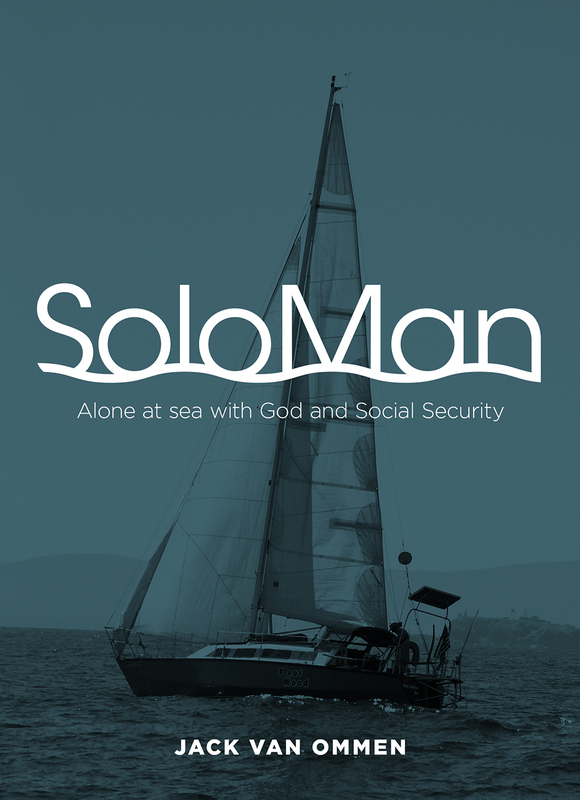 They are sailors, spent two years in Tortola working with a charter fleet. We had drinks in the Victoria Hotel, a very nice hotel, done in the style of the Royal Hawaiian. 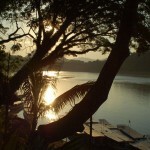 With a grandiose view of two branches of the Mekong. They are staying in a hotel just down from on us on the river front here in Pnom Penh. 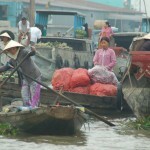 We left early in the morning from Chau Duc, Vietnam on the Mekong near the Cambodia border, by boat. 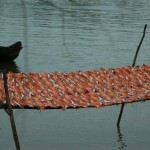 first we visted a fish farm where they were raising, mostly, Tilappia. Most for export. 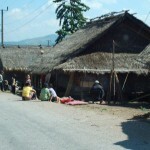 The next stop was at a Cham village. The Chams in Vietnam are 90% Muslims. Many of them fled to Malaysia when the South was “liberated”. Some of the older men in this village new to speak some Malay. I have to read up on why the Chams became predominantly Muslims. The chams from the 600 to 1200 B.C. period were Hindu. The weather did not cooperate it rained almost non stop from Tuesday afternoon through this morning. The curtains were drawn most of the trip to P.P., to keep the rain out. To-day we saw the National Museum, a treasure of antiquities of this incredible sophisticated culture. 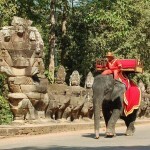 We will see a lot more of this at Angkor Wat. Then we got our bicycles. Hesitant at first, we visited the terrible prison, turned into a museum/memorial of the atrocities committed by the Khmer Rouge. On the way back we had a peak of a pagoda through an alley way. We snaked through narrow alleys to find the entrance. It turned out to be the Prayou Vong pagoda. It was built a 100n years ago. Six monks make their home here. One of the monks, I assume the leader, spoke good French. We sat down and had tea with him. 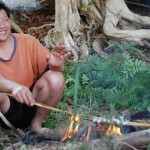 Am Sam Nang (Chheng) turned out to be a fascinating man. 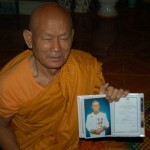 He had served in the French and then the Cambodian Navy. He had spent time at Subic Bay in the sixties. He was forced into slave labor by the Kmer Rouge but managed to hide his identity because his previous government service functions would have been a death sentence. He survived. Then he ended up as under secretary of state under Noradom Shihanouk. He became a monk in 1996 when he was 61. This was definitely an unusual coincidence. 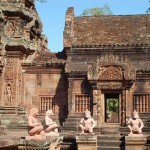 This temple is completely hidden from the town and totally surrounded by the slums and not on any tourist itinerary. It is Wednesday morning 6 a.m. I am having my first Cafe Sue Nam. It is still dark. 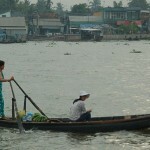 We are to be picked up at 6.15 to go to the boat that will take us from the Vietnam border to Pnom Penh on the Mekong. 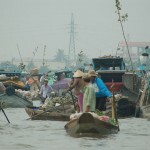 Tuesday was spent all morning on the river at Can Tho. First to see the floating market. A bee’s nest of small river barges and row boats exchanging vegetables and fruits brought in from all over the surrounding villages. The smaller boats would purchase from the larger ones that carry one item, cabbages, pineapples, etc. and then take it to their market stall or shops. A very colorful place. We then proceeded up a side branch to a noodle factory. This was fascinating. Very primitive and age old process but extremely efficient. The chaff of the rice is used again as fuel. Just as the coconut shells were used as fuel in yesterday’s visit to the candy factory. Met new people made new friends, here in Chau Doc we ran into two brave Dutch ladies, in their late fifties, from Utrecht and Amersfoort who are cycling through Thailand, cambodia and Vietnam. 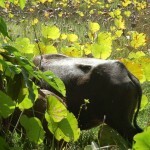 Next blog from Cambodia.